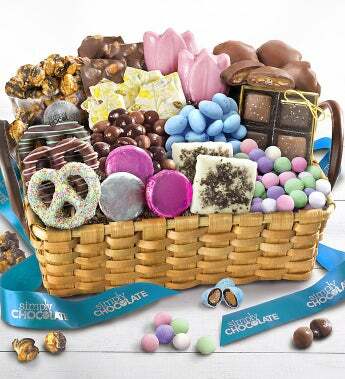 This ultimate deluxe Spring chocolates basket will truly send a message of love for family and friends. It is brimming with milk chocolate almond bark, chocolate pecan clusters, sea salt caramels, caramel robin eggs, lemon pistachio bark, chocolate covered OREO Cookies, pretzels and grahams, and much more! Tied with a beautiful Simply Chocolate ribbon.